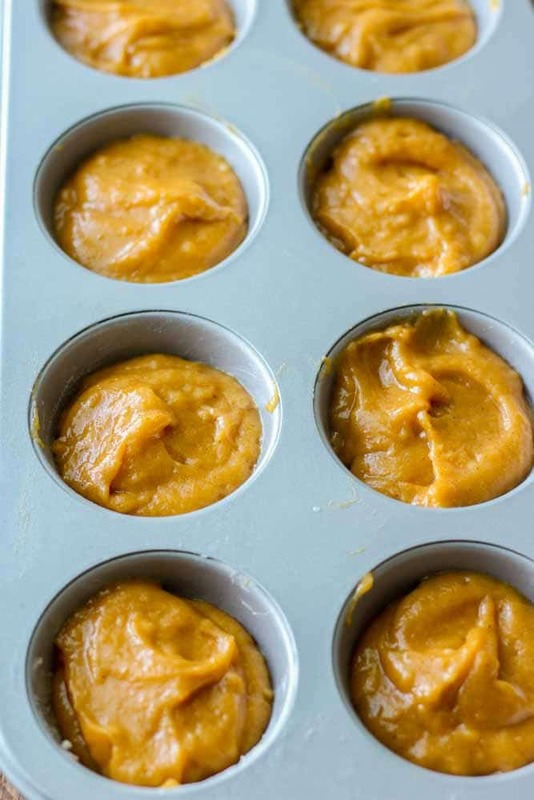 Sit back with a cup of coffee and get ready to enjoy these light and moist pumpkin muffins with all the great cinnamon pumpkin spice flavors. They’re heaping with cinnamon streusel that melts in your mouth with a sip of coffee. Then top with a maple brown butter glaze to finish the trifecta of yummy. 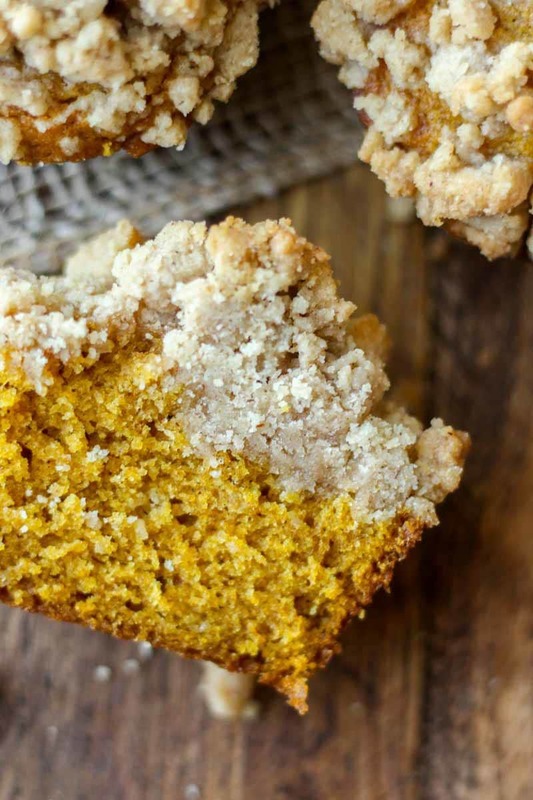 Fall baking recipes are here and this one needs to be on the top of your must-make list! I fell in love with coffee cake because my grandma used to make it every Christmas. I loved it so much that I turned it into a coffee cake muffin. And because I love that coffee cake muffin recipe so much I decided to turn it in to a fall pumpkin recipe. Because I’m basic like that. I actually want to eat this muffin while drinking a PSL, wearing my Uggs and a flannel and watching Gossip Girl. Basic as basic comes, I know. On a somewhat unrelated note, I have to share some awesome news with all of you! I’m in a season of my life where I feel like everything is falling in to place. I was driving home from work yesterday thinking about how my family is happy and healthy, I have an awesome supportive boyfriend, my friends are the best and I’ve found the most wonderful church family and couldn’t ask for anything more. AND I got promoted yesterday!!!!! So super stoked and beyond grateful for all the people who’ve mentored/taught and given me advice in my career. I’m officially the Manager of Social at a marketing agency here in Columbus, OH❤️. Obviously I can appreciate this season because I’ve been through some not so great seasons of life. So I’m truly appreciating this moment and learning that I can just be happy where I am. It reminded me of a devotional I read that morning. Coincidence? I think not! It was all about how we miss out on our own happiness when we start comparing ourself to others and hoping for what they have. We tend to see others as perfect people and idealize them instead of humanizing them. Because we’re all human and go through struggles in our own story. I’m completely guilty of this. Anyone else? My goal is to change my mindset and focus on being content and grateful for where I am and the process and journey I’m on instead of looking at other people and wishing I had what they have. Anyone with me?! And this starts with enjoying the small simple things. 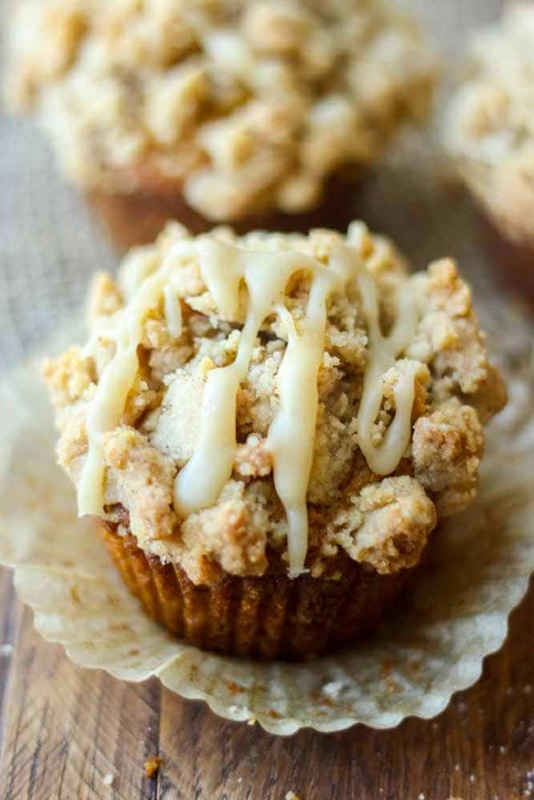 Like pumpkin streusel muffins! The base of this muffin is an easy-as-pie recipe. Mix all of the ingredients and fill about 3/4 of the muffin tins with batter. When you’re filling muffin tins you can be a little more generous with the batter than compared to a cupcake recipe. 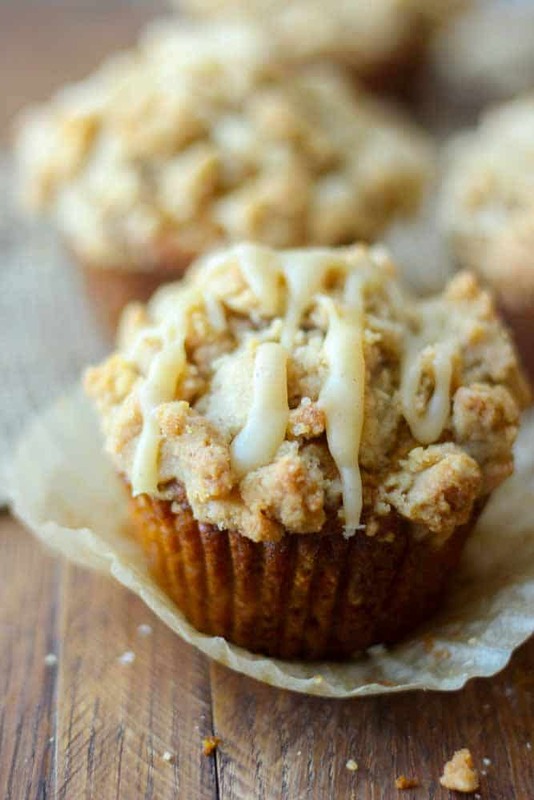 We want big tall muffins overflow with streusel here. The next step is filling the tins the rest of the way with the crumbly cinnamon streusel topping. 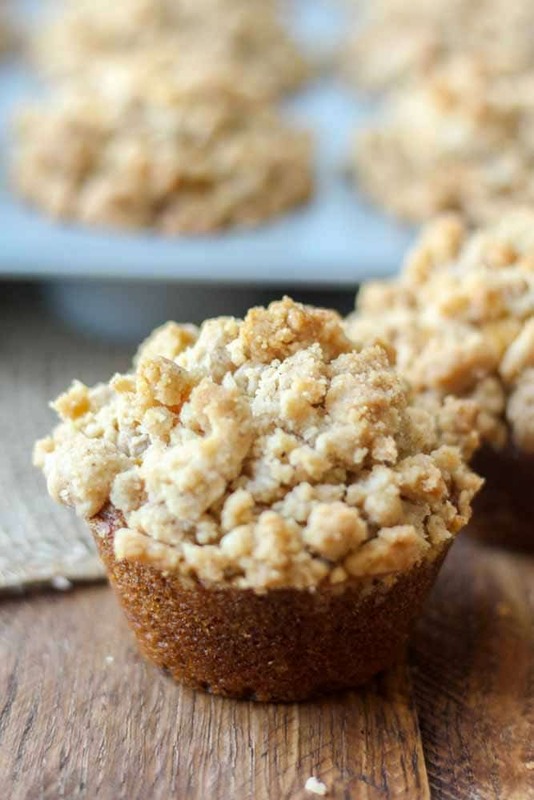 You’re going to feel like there is way too much streusel to muffin ratio. This is okay. Great, even. Just keep filling, I promise! 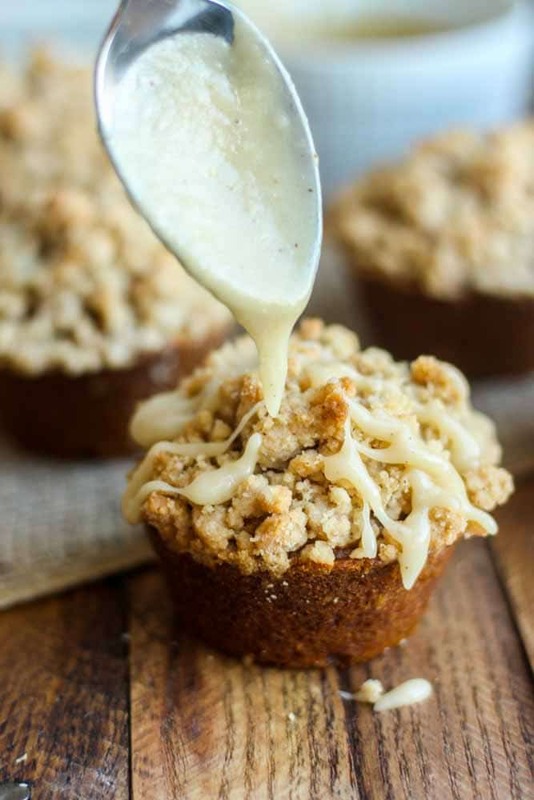 You literally want the streusel to be pouring over the muffin batter in a heaping pile. Press it down just slightly so it stays in place and bake away! I like to cook my muffins on higher heat for the first half of the baking process. This allows the muffins to rise quickly with the hotter temperature. Then turn the oven down and allow the batter to cook all the way through. It will be soft and moist and filled with all the pumpkin spice flavors. Now for the best part. MAPLE BROWN BUTTER glaze. I sort of just want to put this on top of everything I make this fall. It’s gloriously sweet and has a depth from the brown butter and tastes so much like fall from the maple. 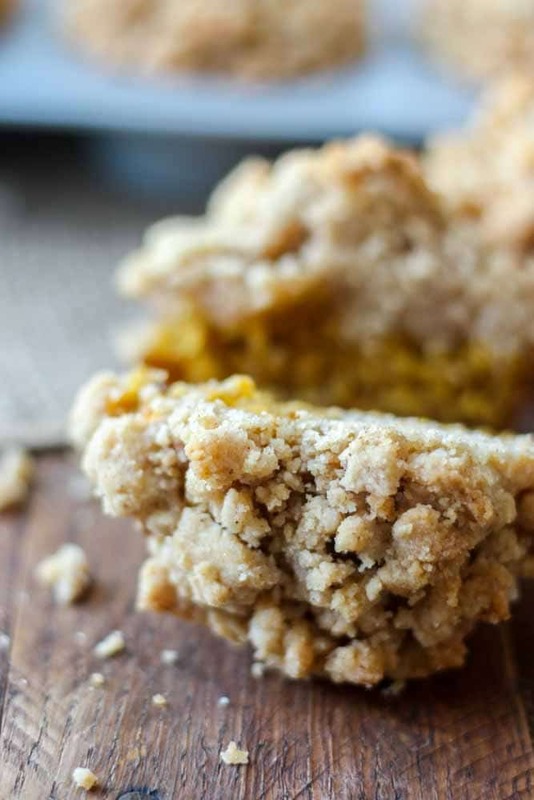 It’s just what these pumpkin streusel muffins need. Now go forth and begin being basic too!? To make the crumb topping: combine sugars, cinnamon and salt in a medium bowl. Whisk in melted butter and add flour. Stir using a rubber spatula just until moist. The mixture will not look very crumbly yet. 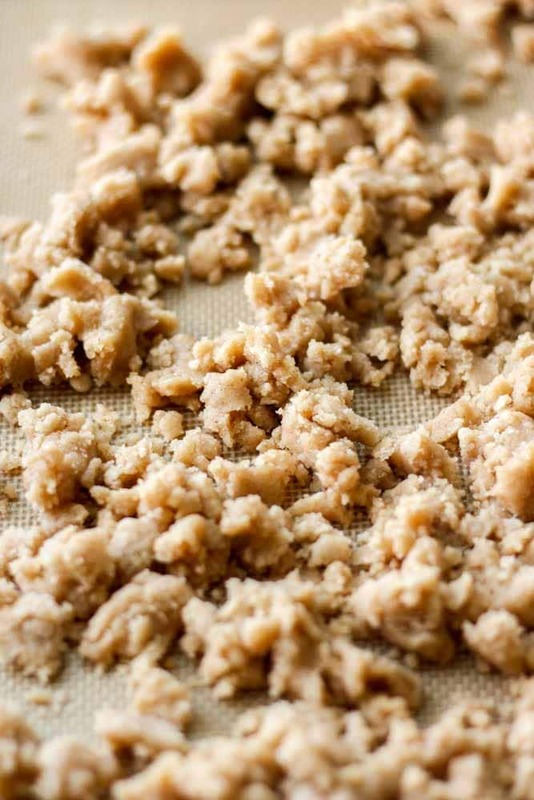 Spread out mixture on parchment paper to dry until crumbly ready to use. To make the muffins: Preheat oven to 375° F. Place paper liners in a regular sized muffin pan and set aside. In a large bowl, beat the eggs, brown sugar, granulated sugar, pumpkin and oil until smooth. In a medium bowl, combine the flour, baking soda, baking powder, pumpkin pie spice and salt until combined. Add the flour mixture slowly to pumpkin mixture and mix well. Fill paper-lined muffin cups three-fourths of the way full. 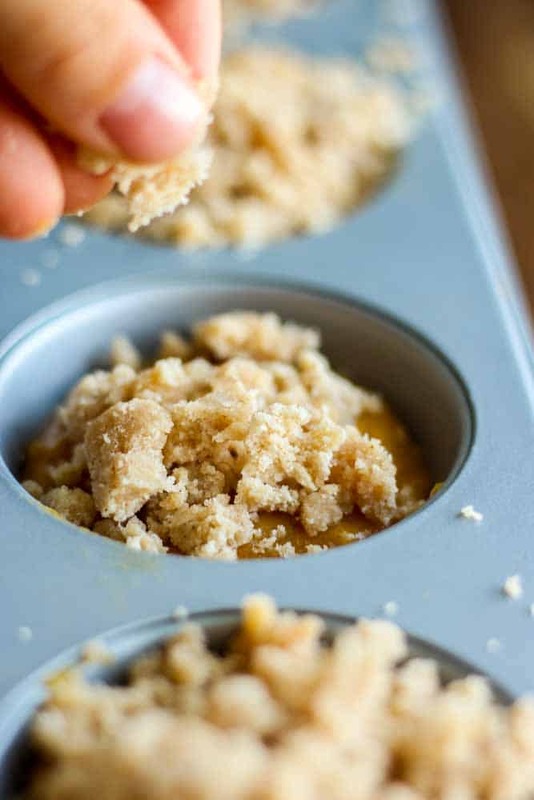 Top the muffin batter with the crumble topping until they're overflowing. Push it down slightly to keep it in place. Bake the muffins for 10 minutes at 375 degrees then reduce the heat to 350 and bake for another 10-12 minutes, until muffins are set. Do not overbake. Cool in pan for 10 minutes before removing to a wire rack. While muffins are cooling, make the brown butter maple drizzle. In a medium saucepan over medium-high heat, melt the butter. Allow to cook until brown specs begin to form at the bottom of the pan, about 3 minutes. Once formed, stir immediately and remove from heat. Add the powdered sugar, vanilla, maple syrup and water and stir vigorously until smooth. Add more water a tablespoon at a time until you get the desired consistency to drizzle over muffins. Using a spoon, drizzle over baked muffins and serve immediately or store in a air tight container for up to one week. Or freeze for one month. These look delicious, great for an autumn treat! Thanks for sharing. Of course! Thanks so much for taking the time to share. Okay yeah, I’ll take a dozen. Or two. Okay, maybe three. These look SO darn good! Thank you, Karly! Wish I could package these up and send them your way! Don’t you love fall baking?! It says ‘cool in pan for 0 minutes’. Is that supposed to be 10 minutes? Hey Adrienne! Yep, there should be a 1 in front to say 10. Looks like I need a proofreader to help me:) Thanks for asking! I made these yesterday (forgot to do the icing, oops!) but holy moly are they amazing. I’ve probably eaten like 6 and it hasn’t even been 24 hours yet… I highly recommend!! Thanks, Holly! So glad you liked them. Thank you so much for taking the time to share!